Guest Post by Prof. David Opderbeck (Seton Hall), originally published on his blog The CyberSecurity Lawyer. Trade secrets are important to cybersecurity because many data breaches involve trade secret theft. The Defend Trade Secrets Act of 2016 (DTSA) amended the Espionage Act of 1996 to provide a federal private right of action for trade secret misappropriation. Some commentators opposed the DTSA in part because it seems redundant in light of state trade secret law and could lead to unnecessary litigation and restrictions on innovation. Now that the DTSA has been in effect for nearly a year, I conducted an empirical study of cases asserting DTSA claims (with the able help of my research assistant, Zach Hansen). This post summarizes the results of that study. 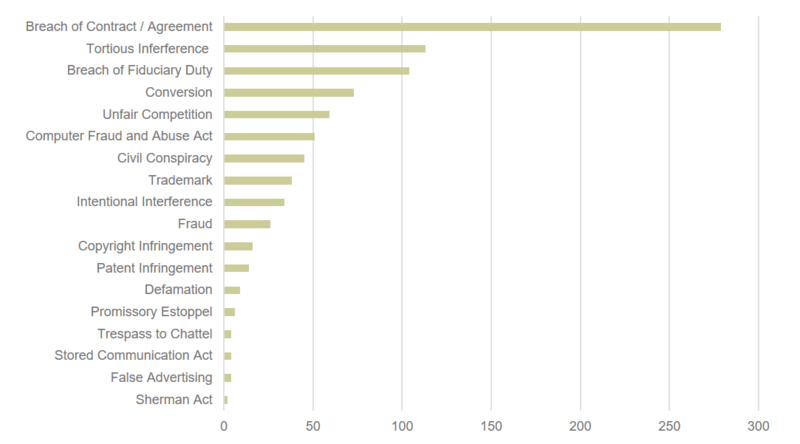 We ran keyword searches in the Bloomberg Law federal docket database to identify cases asserting DTSA claims in federal courts. It is not possible to search only on the Civil Cover Sheet because there is no discrete code for DTSA claims. Our search ran from the effective date of the DTSA (May 26, 2016) through April 21, 2017 (just prior to our symposium on the DTSA at Seton Hall Law School). After de-duping, we identified 280 unique Complaints, which we coded for a variety of descriptive information. Our raw data is available online. We were not surprised to see that the Northern and Central Districts of California, Southern District of New York, or District of Massachusetts were among the top five. We were surprised, however, to see the Northern District of Illinois tied for first. This could reflect the influence of the financial services industry in Chicago, but further research is required. It is interesting to note the decline in filings following the initial uptick after the May 26, 2016 effective date. Perhaps this reflects a slight lull during the summer months. Filings then remained relatively steady until March, 2017, when they increased significantly. This could have something to do with the quarterly business cycle or bonus season, since many of the cases (as discussed below) involve employment issues. Or, it could reflect a random variation given the relatively small sample size. We excluded from this chart related state law trade secret claims. Not surprisingly, nearly all the cases included claims for breach of contract. As noted above, trade secret claims often arise in the employment context in connection with allegations of breach of a confidentiality agreement or covenant not to compete. Another finding of note was that a fair number of cases assert Computer Fraud and Abuse Act claims, although the number is not as high as expected. Most trade secret cases today involve exfiltration of electronic information, but perhaps many cases do not involve hacking or other access techniques that could run afoul of the CFAA. We also noted a smaller but not insignificant number of cases asserting other intellectual property claims, including trademark, copyright and patent infringement. Since many documents taken in alleged trade secret thefts are subject to other forms of intellectual property — particularly copyright — this may show that some lawyers are catching on to the benefit of asserting such claims along with DTSA claims. At first blush, the number of cases dismissed seems high, given that none of the cases have been pending for more than a year. We assume the vast majority of these cases settled, though further investigation is required. In contrast, the number of preliminary injunctions granted seems very low. Again, further investigation is required, but so far it does not seem that the DTSA is resulting in the kind of preliminary injunction practice we expected to see under a federal trade secret statute. Wow, tech workers you are going to be hurting bad when trade secret law ramps up. I tend to agree that the Chicago hitting top of the trade secrets dispute list is attributed to the concentration of hedge funds there and the disputes which arise when employees move/shift jobs between firms. Hedge funds, patents and trade secrets, oh my. Business is conducted in flyover country.